The man-child is leaving the nest today. We’re packing up the SUV and he’s heading to Montreal where he’ll be studying music at McGill. He’s my younger son, the one I that homeschooled for almost three years when we lived in Atlanta. He’s funny, sarcastic, and has been the household (and car) music director, always surprising us with what he has on his iPod. Obligatory baby pic. Michael at 3 months. Homeschooling project: making rock candy. He studied for a couple of years of Saturdays at the Toronto Japanese Language School, and won the Idea Prize for his depiction of the character for “Sword”. Michael started studying the tuba in Grade 8 at St. Michael’s College School. He was disappointed that art got swapped out for music as the students moved into that grade, and signed up for private music lessons so that he could get out of music one period a week. An assessment of his embouchure led to the option of playing euphonium or tuba. Michael will be forever indebted to Dan Douglas, the music teacher at SMCS, for pointing him in that direction. He has had a series of wonderful teachers. He started with Courtney Lambert who had to put up with his lack of organization skills and time management issues. She went on leave late in the school year (I hope it wasn’t because of Michael…) and Rob Teehan stepped in to fill the gap. Rob was a young guy, starting out in his musical career, and Michael was (by choice) his only private student. Rob has since gone on to form and play with the Heavyweights Brass Band, the Lemon Bucket Orkestra, The Boxcar Boys and compose. He was composer-in-residence with the National Youth Orchestra of Canada winning a Juno-nomination for his work Dreams of Flying. He’s also started on a film-scoring journey. Michael very much looks to Rob as a mentor, and Rob is always available for advice and thoughts about life as a musician. Michael met Sasha Johnson while playing with the Hannaford Youth Band. Sasha was a tubist in the Hannaford Street Silver Band at the time. Then Michael had the opportunity to study with him at the Interprovincial Music Camp and decided to start private lessons with him. He will continue to study with Sasha at McGill. Michael jammed in a couple of last minute lessons this week with his voice teacher, Paula Wickberg. He wants to try out for an early music vocal ensemble at McGill so he’s been preparing a piece by Monteverdi. 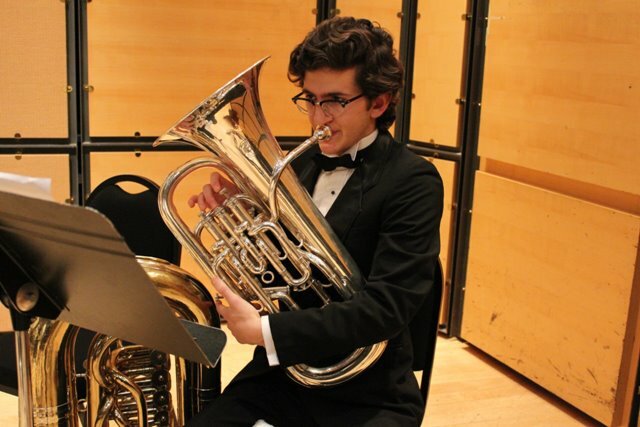 He’s also hoping to put his trombone to use in Montreal, but we haven’t heard much from it his summer as he’s been playing tuba with the Weston Silver Band and preparing for ensemble auditions. I joke that his room will become my sewing studio once he’s gone, but I will miss him dearly. His good-humoured presence and conversational skills have been a force for good in this household.